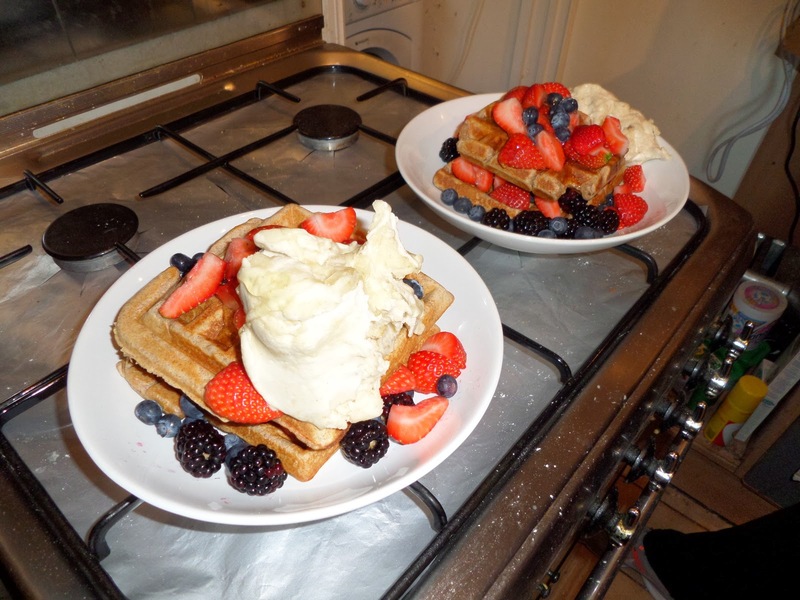 This week I’m doing a sweet version, so it’s cinnamon flavour in the waffles, then serving them with strawberries, blackberries, blueberries and banana (fake) ice cream with a drizzle of honey on top. For the previous batch of sourdough waffles we had way too much batter, so as planned I’m halving the amounts, but keeping a full cup of sourdough starter, and reducing the amount of milk to compensate. This results in a bit more flour in the recipe, but as it was a very wet batter, and I’m going to use wholemeal flour which doesn’t absorb water as well as white flour, I’m sure this won’t be a problem. 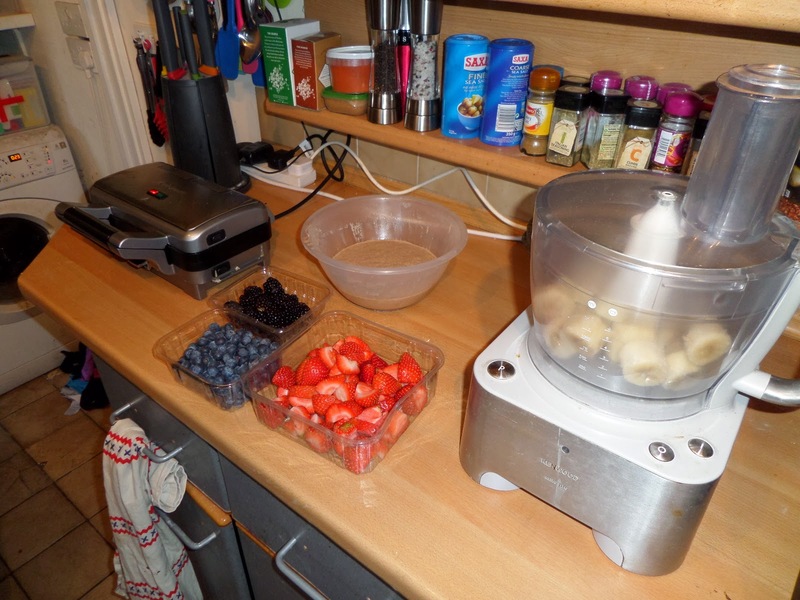 Finally these are cinnamon waffles so I’m adding 1 tsp of cinnamon, and not halving the single tbsp of sugar. Another slight change is that I’m going to cook them for 4m30s (instead of 4m) as the previous batch could have done with slightly more browning in parts, in my opinion. The batter was much thicker than before, and this made measuring out ladles of it tricky, mainly because it was different, rather than actually more difficult. The 4m30s worked well; they were denser than using plain flour, but that’s expected. However I’ll probably try 5 minutes next time, if for no other reason than to see what happens! So… huge plates of food! It was delicious and really filling. The only minor issue was you couldn’t really taste the cinnamon, so I think I’ll use at least 2 tsp when (not if!) we do these again. We worked out the calories and it’s about 600 kcals — pretty damned good for such a huge plate of food!